United Snacks at Widnes has installed the first of a radically new design of bagging machine, developed by Italian manufacturer PFM to provide higher levels of automation for film reel changing and set-up, as well as greater accuracy and consistency in seal quality. “Reel change is very much quicker than before, the layout of the machine gives much more space to load new reels and the self-tracking nature of the system means any issues with back seals are rare,” he says. The new PFM R700 machine, used to handle 8 and 11g bags of United Snacks’ Corn Puffs at speeds of 100-120 a minute, breaks new ground in bagging machine design by carrying the film unwind mechanism at the side, rather than traditionally at the rear. This allows the film path to include a turner bar, the key to the system, immediately before the forming tube. The angle of the bar is adjustable via motors to provide lateral movement of the film, and hence automatic film centring, with the position held in memory and monitored electronically during production. No longer is it necessary for the operator to centre film largely by hand on a trial-and-error basis, using adjustable reel cones. 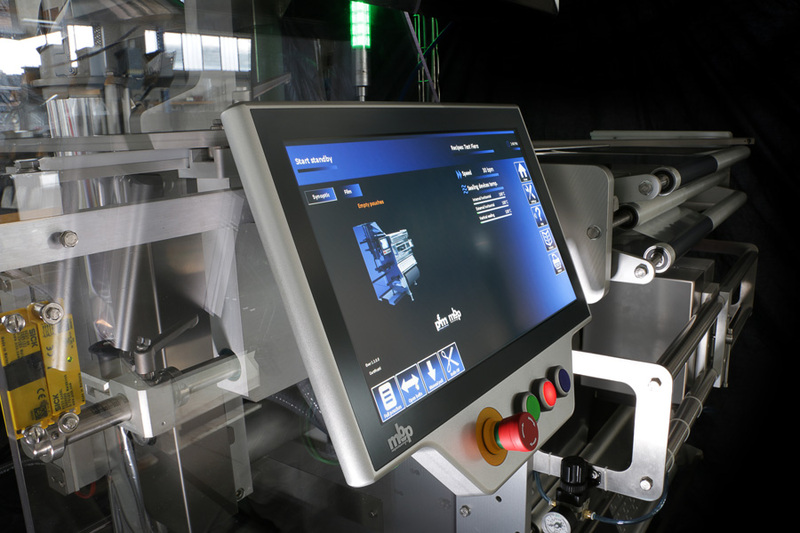 At the same, the operator now has a clear view of both the film feed and the bag-making section during set-up and can manage the process from a single point, at the control panel, with no need to move between the front and rear of the machine.